About Mona, and the Beginning of the Next Big Project. 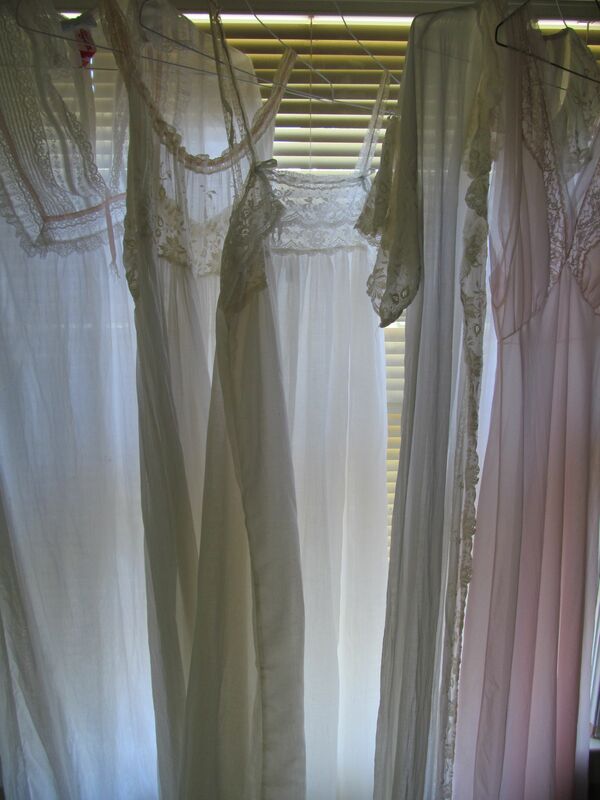 These nightgowns belonged to my mother, when she was much, much younger. They have been in a tidy plastic bin in my linen closet for around 18 years. They will be part of my next big art project. My last long term project was all about my dad. This one is going to be all about my mom. It will be more ambitious than my Ulysses Glove Project. More personal too. And my mother is alive, though she is not quite my mother anymore. My mother wrote a lot. 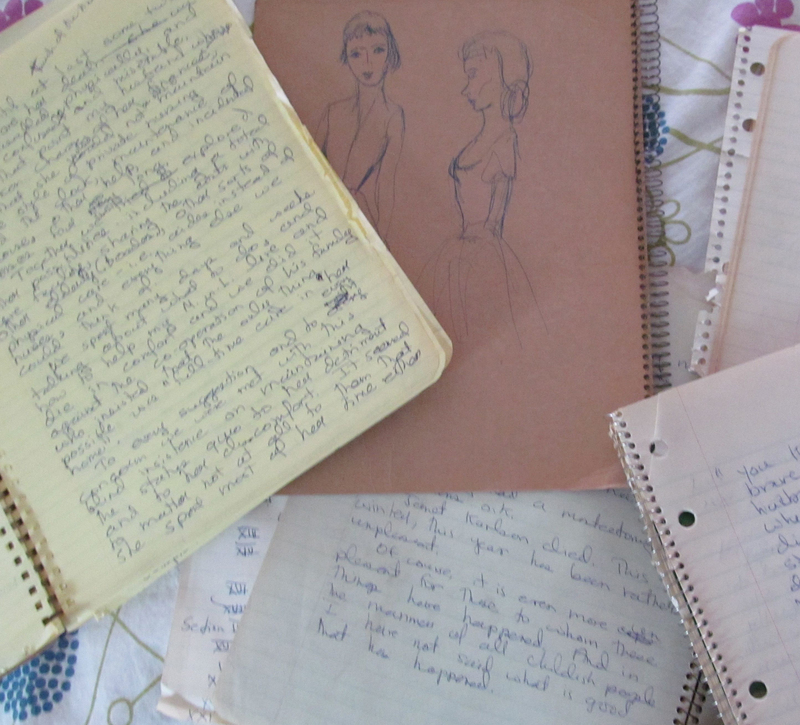 She kept notebooks. I brought them home with me a while ago. I knew she would not notice that they were gone. The writing begins in the 1970’s or so, and the last entry is in 2007, right after my dad died. There are attempts at stories, grocery lists, lists with budgets, expenditures. There are diary entries. There are strange random notes and a smattering of sketches of women. She doodled the same figure every time she doodled. A figure that looks sort of like the women on packets of Simplicity sewing packets. Those nice paper packets that had a pleasant thickness and softness to them. They had paintings on the front with fashionable women in lovely dresses you could sew, if only you could sew. I am going to stitch my mother’s ramblings on to her old, beautiful nighties, in mostly pale thread. That will take long enough. But I realize I want this to be more than a few embroidered nightgowns. I want to show a more complete story. I am going to make paintings from the sketches of women. I hope to also paint a still life or two of her tables with pill bottles, cigarette packages, unfinished knitting projects, copies of Swann’s Way, and piles of magazines. My dream (we artists have elaborate dreams of the shows we’d like to have, or at least I have elaborate dreams) is to have a room with the stitched nighties, the paintings of the sketches, the still life’s, a flowered carpet because my mother liked flowers on everything and anything. In her Liza Lou phase she made me six beaded frames, only around 6″ x 6″. I want to make something to put into the frames…maybe flowers made from cigarettes. Maybe little paintings of flowers. I don’t know. Every time I think about this installation which no one is offering to exhibit, it gets bigger. The first step is going to be to buy my thread. I am going to buy an array of pinks…from bright to pale. And then, I will begin to stitch and stitch and stitch. You are currently browsing the Jessicarant's Blog blog archives for May, 2014.